This brief was prepared by Matthew D. Bramlett, Ph.D., of the Center for Disease Control and Preventions National Center for Health Statistics. The ASPE liaison on the analysis was Laura Radel. The National Survey of Adoptive Parents (NSAP) was the first large-scale population survey of adopted children that was nationally representative of all adopted children in the United States, including children of all adoption types: children adopted internationally, children adopted from the foster care system, and children adopted through private domestic avenues. This new resource represents a wealth of data about the characteristics, well-being, and adoption-related experiences (including need and use of post-adoption services and supports) of adopted children and their families. However, there is potential for misinterpretation of some indicators if there are no comparable benchmark estimates for the general population of children. For example, if estimates from NSAP show that 75% of adopted children have a desired outcome and 25% experience a negative outcome, that means something different if the comparable rates for all children are 90% and 10%, than if the comparable rates are 70% and 30%. In recognition of this potential issue, some NSAP questions were asked of a random sample representing all children, to allow for comparisons on selected indicators of school performance and family relationship quality. This brief report presents the comparison of adopted children and all children on these measures. Because the population of adopted children is not homogenous and varies considerably on many dimensions by adoption type (Vandivere et al., 2009), estimates of school performance and relationship quality for adopted children by adoption type are also presented. Finally, adjusted estimates that control for demographic and socioeconomic differences among adoption types are examined to evaluate whether differences in school performance and relationship quality by adoption type are explained by demographic and socioeconomic differences between adoption types. The National Survey of Adoptive Parents (NSAP) was a random-digit-dial telephone survey of households in the United States that contained a child 0-17 years of age who lived with at least one English-speaking adoptive parent and no biological parents. The NSAP interview was administered to 2,089 adoptive parents between April 2007 and July 2008, including parents of 545 children adopted internationally, 763 children adopted from the U.S. foster care system, and 781 children adopted from private domestic sources. The survey includes information on the characteristics, well-being and service utilization of adopted children and their families. NSAP was sponsored by the Department of Health and Human Services (HHS) Office of the Assistant Secretary for Planning and Evaluation and HHS Administration for Children and Families, and conducted by the National Center for Health Statistics (NCHS) as a module of the State and Local Area Integrated Telephone Survey (SLAITS). Eligible respondents for NSAP were identified during the administration of the 2007 National Survey of Childrens Health (NSCH), a SLAITS module sponsored by the Health Resources and Services Administrations Maternal and Child Health Bureau and conducted by NCHS. For the NSCH, one child in each household with children (the sample child) was randomly selected to be the target of the NSCH interview. Respondents were adults in the household who were knowledgeable about the childs health. The NSCH included questions that identified the adoptive status of parents in the household. Specifically, respondents who were either the sample childs mother or father were asked if they were the biological, step, foster, or adoptive mother/father. They were also asked if there were any other adults in the household who acted as parents to the child, and if so, what their specific relationship to the child was. For children living with relatives without a parent present, the relative respondent was asked if he or she had legally adopted the child. At the end of the NSCH interview, respondents who were identified as adoptive parents were recruited for NSAP; while respondents had the option of continuing directly into the NSAP interview, most opted for a callback scheduled at a later time. Roughly 3% of the 91,642 NSCH respondents (a total of 2,737) were eligible for NSAP, and 2,089 NSAP interviews were completed, a 76% cooperation rate. 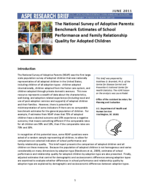 NSAP sampling weights were adjusted for nonresponse such that the 2,089 NSAP cases represented the same population of adopted children represented by the 2,737 NSAP-eligible cases in NSCH. More information about the sample design, response rates, and weighting procedures for the NSAP and NSCH can be found in the methodology reports for each (Bramlett et al., 2010; Blumberg et al., forthcoming, respectively). In order to obtain an appropriate comparison sample of all children, it was not necessary to ask the school performance and relationship quality questions of all NSCH respondents. Rather, an NSCH subgroup of approximately the same size as the NSAP sample was randomly subsampled from among NSCH respondents. This subsample is called the NSAP Control Sample, and numbered 2,022. The NSAP Control Sample questions were embedded in the NSCH questionnaire and were only asked of the subsample. A separate weight variable was created that allowed these 2,022 NSAP Control Sample cases to represent the same population of all children as that represented by the full NSCH sample of 91,642 children. Overlap between the NSAP sample of adopted children and the NSAP Control Sample of all children was possible. The school performance and family relationship quality variables that were included in the NSAP Control sample interview are shown in Table 1, with NSCH and NSAP variable names. With one exception, all NSCH-NSAP variable pairs had identical question wording and response options. The exception is the pair of NSCH and NSAP variables that measure how often the child is affectionate or tender with the parent. Early in data collection, it was discovered that the two versions of this variable did not have the same response option set. At that point in data collection, the response options for the NSCH version of the variable were changed to match those of the NSAP version. Table 2 shows how the differing sets of response options from before and after this change was made were reconciled for this analysis. To facilitate the reconciliation of response option sets, the categories usually and always were collapsed together in the final set of options for both versions of the variable. Except as follows, NSCH and NSAP questions pairs were asked of the full NSAP-Control and NSAP samples, or of comparable subsamples. NSCH questions measuring school performance were asked about children ages 6-17, while comparable NSAP questions were asked about children ages 5-17. Comparisons based on these variables used comparable age groups (i.e., 6-17). Similarly, the NSCH question measuring whether parents make decisions with the child was asked about children ages 12-17, while the comparable NSAP question was asked about children ages 13-17. Again, comparisons based on these variables used comparable age groups (i.e., 13-17). Weighted estimates of school performance and relationship quality indicators were calculated in SUDAAN to account for the complex sample design of the NSCH and NSAP using the Taylor Series approximation method(RTI, 2008). Refer to the NSAP and NSCH Design and Operations reports for more detail on the sampling weights (Bramlett et al., 2010; Blumberg et al., forthcoming). The significance of differences was evaluated with t-tests at the 0.05 level. Statistical comparisons by adoption type were assessed using a t-test of the difference of proportions; estimates for international adoptions and private domestic adoptions were each compared with estimates for foster care adoptions and also with each other. Although making multiple comparisons with the same referent group can result in a heightened risk of making any one Type-II error, no arbitrary adjustments were made to account for multiple comparisons, as each test is evaluated independently and results are interpreted appropriately. Statistical comparisons of adopted children with all children, or comparisons of children of a particular adoption type with all children or all adopted children, were assessed using a t-test of the difference of proportions, where the standard error of the difference was adjusted to account for nonindependence of the two groups by incorporating their covariance. Estimates with a relative standard error (standard error divided by the estimate) higher than 0.3 do not meet National Center for Health Statistics standards for reliability and are flagged as unreliable in the tables. Each relationship quality variable had at least one category with very low frequencies that yielded unreliable estimates due to large relative standard errors, and categories were collapsed accordingly to minimize the number of unreliable estimates. For K8Q22/W1, somewhat distant and very distant were collapsed to distant; for K8Q23/W2, K8Q25/W6, and K8Q26/W4, rarely and never were collapsed to rarely/never; and for K8Q24/W5, usually and always were collapsed to usually/always. Academic measures (such as school engagement and repeating a grade) and family functioning (including measures of parental stress) have been shown to be associated with demographic and/or socioeconomic differences (US DHHS, 2009). Children adopted through different adoption types have been shown to have varying demographic profiles (Vandivere et al., 2009). To ensure that differences in school performance and family relationship quality among children of different adoption types are not simply reflections of their families demographic or socioeconomic differences, estimates of school performance and relationship quality are adjusted to account for demographic and socioeconomic differences among adoption types. These demographic and socioeconomic characteristics (age at adoption, gender, race/ethnicity, transracial adoption, and household income and education) are shown in table 3. To control for demographic and socioeconomic differences among adoption types, adjusted estimates of school performance and family relationship quality were calculated as predicted marginals using the PREDMARG option in the logistic regression procedure RLOGIST in SUDAAN (RTI, 2008). The significance of differences between predicted marginals was assessed at the 0.05 level by the PRED_EFF option. The adjusted estimates allow the comparison of the school performance and relationship quality of adopted children in different adoption types as if the groups had the same demographic and socioeconomic characteristics. Cases with missing data for any of the demographic or socioeconomic characteristics (with the exception of household income relative to the poverty level) were excluded from the predicted marginal adjustment analysis. Multiply-imputed data for income relative to poverty are available for the 2007 NSCH, and using these data, with the appropriate SUDAAN procedures to incorporate the uncertainty of the imputation process, reduced the extent of missing data in the multivariate logistic regression models from 8.0% to 1.6%. Table 4 shows the comparison of all children and adopted children, and of adopted children by adoption type, for the two school performance and five family relationship quality variables. Adopted children show poorer school performance for both measures, being less likely to have excellent reading or math and more likely to have fair or poor reading or math, compared to all children. The comparison by adoption type shows that children adopted from foster care account for much of this difference and have lower achievement than children adopted through private domestic sources. For both reading and math, children adopted from foster care are less likely to be rated excellent and more likely to be rated poor than children adopted privately within the U.S.
Family relationship quality is less differentiated between adopted children and all children, and differences that do exist are inconsistent in direction. Adopted childrens parents are more likely to say they are rarely or never affectionate with the child or rarely or never trust the child, but also are more likely to say they always make decisions together with their adolescent adopted child. Differences by adoption type consistently show somewhat less positive outcomes for children adopted from foster care, but many of the differences are not statistically significant. In addition, although large majorities of children in all adoption types have parents who report affectionate behavior from and warm and close relationships with their adopted child, children adopted from foster care are less likely than all children and other adopted children to have a very warm and close relationship with the respondent parent. They are also less likely than internationally-adopted children to be usually or always affectionate. These differences were statistically significant. Children adopted from foster care were the only individual adoption type to differ significantly from the general population in the extreme categories (usually/always and never) of being less understandable to their parents. And they are less likely than children adopted privately within the U.S. to be always trusted and more likely to be never trusted, accounting for the difference between adopted children and the general population. Table 5 shows the results of controlling for demographic and socioeconomic differences among adoption type groups. To simplify the comparison and create dichotomous dependent variables for logistic regression, an indicator was generated for each of the school performance or relationship quality measures, measuring the positive extreme or collapsed extreme category (such as excellent/very good, usually/always, or rarely/never). The unadjusted estimates show that children adopted from foster care fare worse on every measure: they are less likely than all other adopted children to excel in math, have a very warm and close relationship with parents, or usually/always be trusted by the parent; are less likely than children adopted internationally to be usually or always affectionate or rarely or never understood by their parents; and are less likely than children adopted in private domestic ways to excel in reading or make decisions together with parents. Once demographic and socioeconomic differences among families adopting through each adoption type are controlled for, many of these differences are greatly reduced or no longer significant. Of particular note is what happened to the school performance measures for children adopted internationally: if internationally-adopted children had the same demographics and socioeconomics as other adopted children, they would be much less likely to excel in reading, compared to either children adopted from foster care or children adopted via private domestic means; and would be comparable to children adopted from foster care but less likely compared with children adopted via private domestic means to excel in math. After controlling for demographic and socioeconomic differences, only one difference in relationship quality remained significant among adoption types, which suggested that children adopted from private domestic sources have more trusting relationships with their parents than children adopted from foster care. Without the benchmark for all children, what would one conclude of the finding that 10% of adopted children are rated poor in reading and 12% are rated poor in math by their parents? Because less than 4% of the general population of children are so rated, this indicates that adopted childrens school performance is disproportionately low. This is not a surprising finding, as adopted children have been shown to be more likely than children living with their biological parents to have special health care needs, current moderate or severe health problems, learning disability, developmental delay or physical impairment, and other mental health difficulties (Bramlett et al., 2007), and adopted children are more likely than children generally to have been diagnosed with depression, Attention Deficit Disorder/Attention Deficit Hyperactivity Disorder, and behavior/conduct disorders (Vandivere et al., 2009), all of which could affect the childs ability to achieve adequate school performance. The benchmarks for the general population put the findings for adopted children in context, and the comparison by adoption type reveals some of the basis for the differences between adopted children and all children in that children adopted from foster care tend to account for more of the adopted children disparity than other adopted children. A comparison of the family relationship quality variables among all the groups in Table 3 except for children adopted from foster care shows very few differences, especially for the relationship to child, affectionate/tender, and trust variables and for the extreme categories (usually/always, never) of the understanding variable. Children adopted from foster care have been shown to be less likely to excel in reading or math and are less engaged in school than other adopted children (Vandivere et al., 2009). The adjusted estimates controlled for demographic and socioeconomic differences among adoption types, and largely leveled the differences, especially between internationally adopted children and children adopted from foster care. Children adopted from foster care are more likely to be adopted at older ages or after suffering parental abuse or neglect (Vandivere et al., 2009) and may have lived in multiple foster homes, so it certainly follows that they may be slower to form close, affectionate, trusting relationships with their adoptive parents than other adopted children would. Household income and education are also lower in foster care adoptive families than in other adoptive families (Vandivere et al., 2009). Both attendance in early childhood school (preschool, kindergarten, etc.) and family functioning (reading to children, parental aggravation) have been shown to be negatively related to lower household income (US DHHS, 2005; US DHHS, 2009), so it is not surprising that controlling for income and other characteristics reduced the differences in school performance and relationship quality among adoption type groups. As sample surveys, the NSCH NSAP Control Sample and the NSAP were subject to non-random error, including coverage bias and nonresponse bias. In addition, these survey findings are based on parents experiences and perceptions about their childrens outcomes and are thus subject to reporting or memory error. As described in the methods section, the problem with the nonmatching response option sets for two l questions was resolved in the best way possible to still allow for cross-survey comparison as was intended for these questions, but there remains potential for statistical noise. For example, one could assume that sometimes always means sometimes but in one set of options, sometimes is the 2nd in a list of 5 options, and in the other set, sometimes is the 3rd in a list of 5 options, which may influence how respondents perceive the neutral or middle category. However, because the response options were adjusted during data collection to match the intended set of options, most cases got the correct set of response options. Of the 2,022 NSAP Control Sample cases, 754 (37%) got the initial, incorrect response options and were recoded as shown in Table 2. Adopted children are less likely than children in the general population to excel in reading or math, but family relationship quality between children and parents is more comparable between the groups. The exception is children adopted from foster care, who do show lower relationship quality than other adopted children for some indicators, and also seem to account for much of the difference between adopted children and children generally in school performance. However, differences in school performance and relationship quality among adoption type groups are largely explained by demographic and socioeconomic differences among the groups. Blumberg SJ, Foster EB, Frasier AM, et al. Design and Operation of the National Survey of Childrens Health, 2007. National Center for Health Statistics, forthcoming. Vital Health Stat 1. Bramlett MD, Radel LF, Blumberg SJ. The health and well-being of adopted children. Pediatrics, 2007; 119 (Suppl): S54-S60. Bramlett MD, Foster EB, Frasier AM, et al. Design and operation of the National Survey of Adoptive Parents, 2007. National Center for Health Statistics, 2010. Vital Health Stat 1(50). Research Triangle Institute. SUDAAN Language Manual, Release 10.0. Research Triangle Park, NC: Research Triangle Institute, 2008. US Department of Health and Human Services (US DHHS), Health Resources and Services Administration, Maternal and Child Health Bureau. The National Survey of Childrens Health, 2003. Rockville, MD: US DHHS, 2005. US Department of Health and Human Services (US DHHS), Health Resources and Services Administration, Maternal and Child Health Bureau. The National Survey of Childrens Health 2007. Rockville, MD: US DHHS, 2009. Vandivere S, Malm K, Radel LF. Adoption USA: A chartbook based on the 2007 National Survey of Adoptive Parents. Washington, DC: U.S. Department of Health and Human Services, Office of the Assistant Secretary for Planning and Evaluation, 2009.